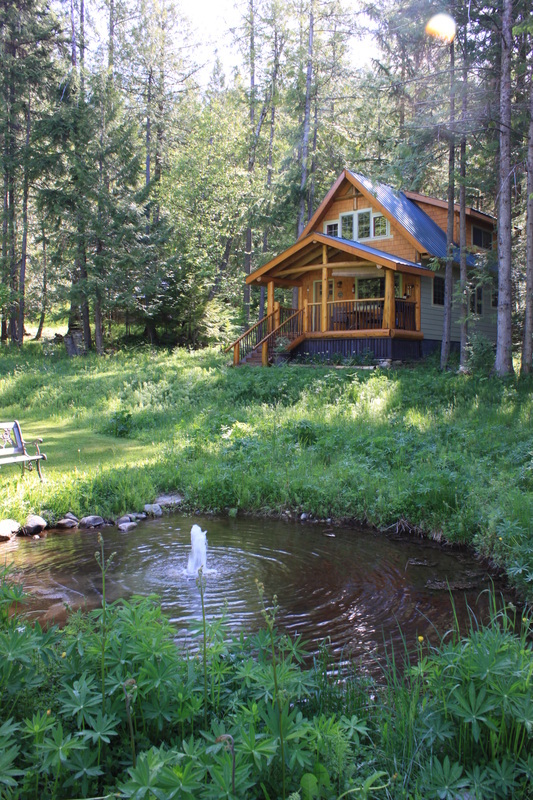 ​​﻿​Two custom-built rental cabins are situated on the 50 acre historic Wedgwood Manor Estate in Crawford Bay, a few minutes from walking trails, a sandy public beach and the world famous Kokanee Springs Golf Course. The cabins are tucked into the edge of the forest and overlook ponds, gardens and large expanses of emerald green lawns. A hiking trail from your back door leads you to a waterfall and a spectacular view of Kokanee Glacier. The cabins spacious floor plans feature lofty cathedral ceilings accented with cedar-log timbers, and shining wood highlights throughout. A badminton court, a series of cascading ponds, and a backdrop of Kokanee Glacier are all part of the view from your lounge chair on the front deck. The cabins are fully furnished, with well-equipped kitchens - all you need to bring is a good book, a good friend and some groceries. If you are looking for peaceful solitude in a classic forest setting with hiking, biking, and cross-country skiing near your doorstep, these cabins await you. Rates do not include 13% tax and are based on 2 adults per cabin. ​Extra adults are $20/night, children under 18 are free. Extra charge of $45/stay for dog. Minimum stay of 2 nights for all season except summer. Summer bookings (June 22-Sept 3 )min stay one week from Saturday to Saturday. We currently do not have online booking. However you can use this calendar to view our availability. If you would like to book please contact us directly, submit the form below...... booking direct with us will get you the best deal. NO SMOKING inside of cabins. In case of CANCELLATION less than 30 days before arrival the deposit will not be refunded, unless another renter is found for the canceled period. We enjoy hiking, canoeing and gardening. We are always happy to share stories with our guests, and make your stay as comfortable and enjoyable as possible. Pictured at left are Joan, John and Titan. My partner and I just spent 3 glorious days at the Robins Nest cabin. It was an incredible space to wind down , be quiet , recharge and enjoy each other's company. We were not daunted by the rainy days as the cabin supplied all our needs and more. My favorite spot was the claw foot tub upstairs in the loft bedroom , nothing to do but soak relax and daydream with the glorious cedar trees watching from outside! I would recommend this spot highly for a couple wanting to get away together and just be. The cabin kitchen is well equipped . We will return to this magical space." Reviewed 11 November 2014 Due to unforeseen circumstances we needed somewhere to stay in a pinch. We called the Manor, and within an hour, the people there rushed to ready a place for us. Given the selection of off-season choices and our last minute request we were skeptical. But when we were met with the warmest of welcomes and escorted to our own private cabin.... We could not believe our luck!!! This place is magical! We stayed in the "Robins Nest Cabin", a dual-level log cabin with all the comforts of home (and then some) without losing a real sense of rustic mountain charm. The kitchen was fantastic and had everything we needed. The downstairs shower was perfect & the upstairs bathtub was a luxurious way to soak and unwind after a day of hiking!!! The location of this little haven could not have been more perfect. Plenty of privacy when you want it, but close enough to helpful advice when you need it! The well-marked trails around the property offer miles of seclusion and natural splendor (the canine hosts of the Manor are happy to accompany you if you wish ;->). We were lucky enough to be invited on an evening hike to view a herd of elk (who knew they make mating calls that sound just like bugles?!) It was a rare privilege that I will never forget. I just can't say enough about this little gem and the wonderful people who run it! It is one of those rare, unexpected places that reminds you about why you packed those bags in the first place! The Cabins are so Nice, Clean and comfortable. The property is awesome. Location is beautiful. Joan and her husband were great! Really enjoyed everything about our stay. Can't recommend this place enough. Location Information: Crawford Bay is located on Highway 3A on the east shore of Kootenay Lake. It is one hour from Nelson (includes a 35 min free ferry ride), and one hour away from Creston (a scenic drive along Kootenay lake). There is a sandy public beach, Kokanee Springs Golf course, boat launch and marina only 5 min away.